The stock market has been rising for a decade now, fueled by fear/incredulity and monetary (M2) expansion. The GDP:M2 ratio, referred to as the velocity of money, represents how often each dollar of M2 money stock is used to purchase domestically-produced goods and services within a given time period. Between 1959 and 1990, it averaged 1.75, between 1995 and 1999, it was 2.20, and today it is at a historic low of 1.46. 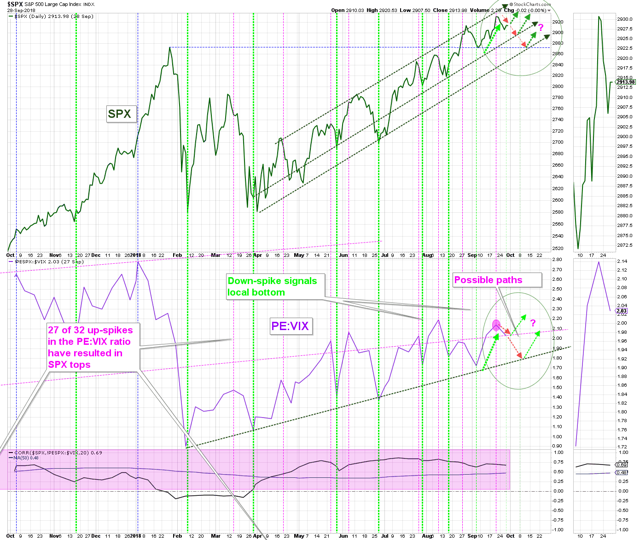 The velocity of money tends to increase during the latter half of expansions as the economy starts to heat up. Five of the last six expansions behaved this way (chart below). However, if we disregard the brief and shallow contraction of 1991, and view 1983 to 2000 as one long expansion, then five of the last five expansions displayed an increase in the velocity of money in the second half. 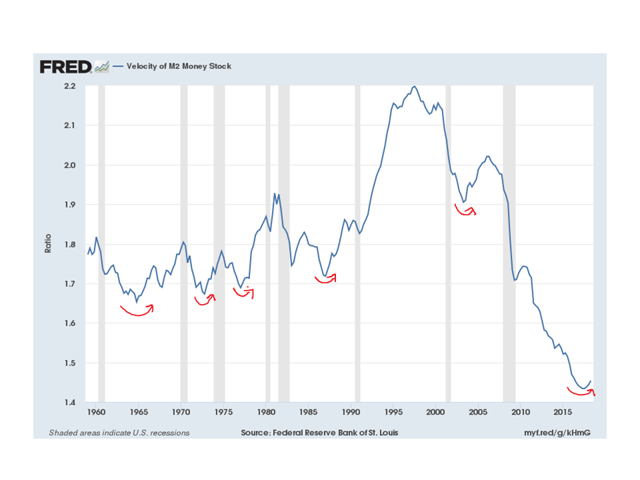 Focusing in on the last four decades of the stock market (chart below), we notice that the velocity of money increased during both the long 1982-2000 bull market, and the shorter 2003-2007 housing rally. Until recently, the present bull market has been accompanied be steadily decreasing velocity of money throughout. Only since the beginning of 2018, has the velocity of money started to accelerate. The Quantitative Easing that started in 2009, expanded the M2 monetary base, but those new funds were, for the most part, delivered to and retained by the financial industry, not the broader economy. 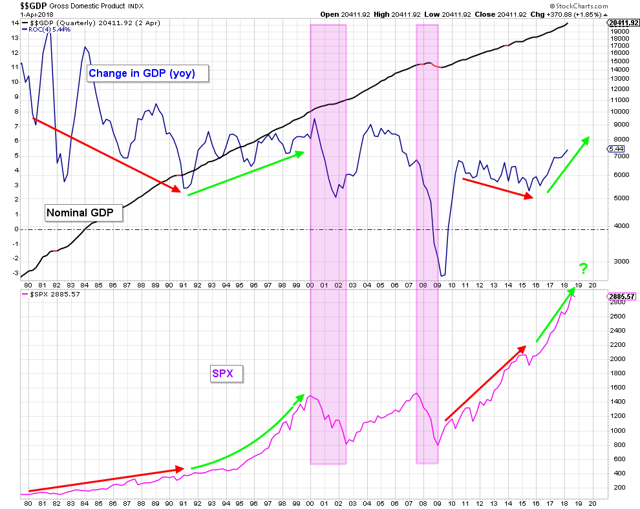 As a consequence, stocks and bonds benefited disproportionately, compared to the GDP. We saw inflation in these assets while the velocity of money and the rest of the economy struggled to stay afloat. We suspect that the recent increase in wages is responsible for the newly-increasing velocity. Wages allow the monetary base to enter the real economy and increase business transactions; every dollar that enters the base of the economic pyramid gets used repeatedly to buy goods and services which increases velocity (chart below). When it comes to GDP growth rates, today's situation is more similar to the period 1982-2000 than it is to 2003-2007. During both the 80's and the first half-dozen years of the current expansion, the rate-of-change of GDP declined while the stock market increased (red arrows in chart below). During the 90's, and now since 2016, both the rate-of-change in GDP and the stock market increased together (green arrows in chart below). The fact that this bull market has been alive for ten-years is not reason enough on its own to declare the it is nearing the end. In fact, there is an argument to be made that, since the real economy is only now receiving some of those QE funds and starting to grow, there is still substantial room for growth before it is in danger of overheating. If we now pull out and look at the last 100-years, we see a staircase-pattern that further supports the idea that today's bull market has more in common with 1982-2000 than with 2003-2007. It is becoming increasingly likely that we are in the midst of the third major up-leg of the century (chart below). 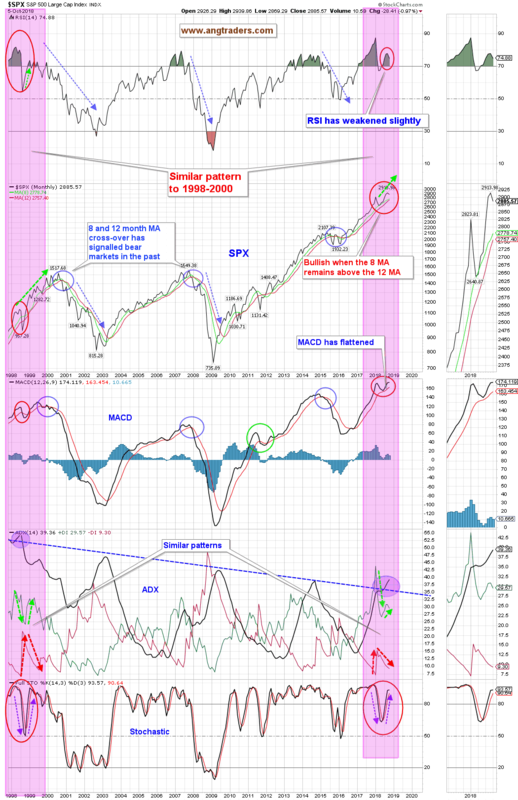 The fact that you could almost taste the fear in the market during the pullback of the last two days of the week, despite being only within 1.5% of an all-time high, confirms that the market will continue to climb the proverbial 'wall-of-worry'. There will be corrections, even painful ones, along the way, but bull markets do not end by drowning in fear. The AAII sentiment survey had a jump in bull sentiment this week. 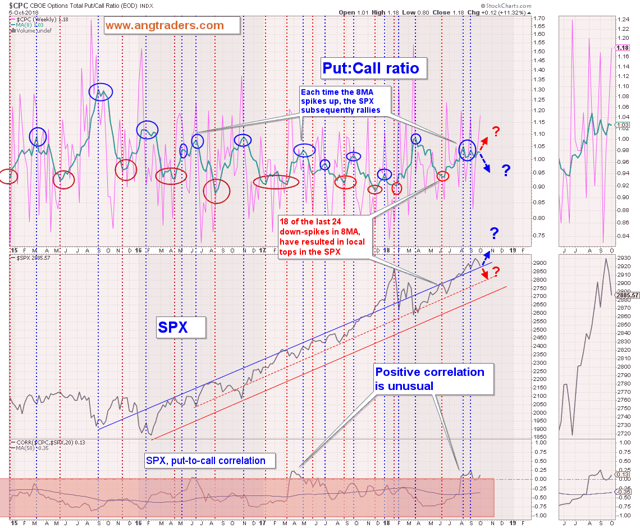 The put-to-call ratio has a strong negative-correlation with the SPX; down-spikes in the 8-week MA indicate local market tops, while up-spikes indicate local bottoms. The average has made two short-term up-spikes and could be in the process of making a third which implies a short-term bottom and a continuing rally (chart below). The price/earnings ratio of the S&P 500, in ratio to the volatility index (PE:VIX), has a strong direct-correlation to the S&P 500; 85% of up-spikes in the ratio correspond with local market tops, while nearly 100% of down-spikes correspond with market lows. At this point, there are several paths possible: the ratio could bounce off the pink-colored trend-line, or it could drop as far as the green-colored trend-line: the SPX could rally right away, or first drop to 2900, or 2870 (previous high and lower trend-line) before rallying. And that is what happened. There may be some follow-though with 2850 and 2800 as targets, but a quick turn-around with the VIX dropping back to its recent lows is not out of the question (chart below). The chart below consolidates several sentiment indicators; the Rydex bear:bull asset ratio, the Rydex bull assets (on its own), AAII bull sentiment , and AAII bear sentiment. Only the Rydex bull assets indicator is weakly negative, while the other three indicators are positive. 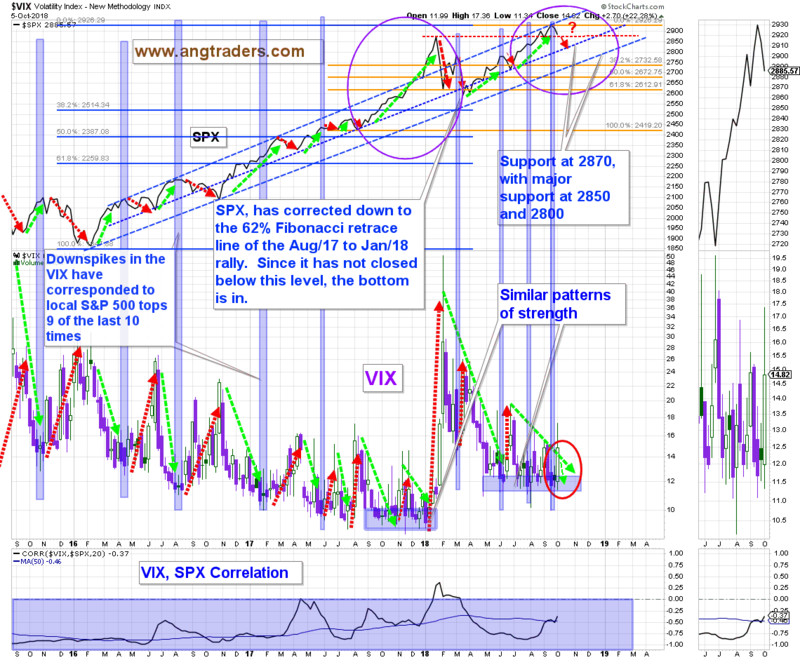 This indicates that a correction is unlikely to be major (chart below). 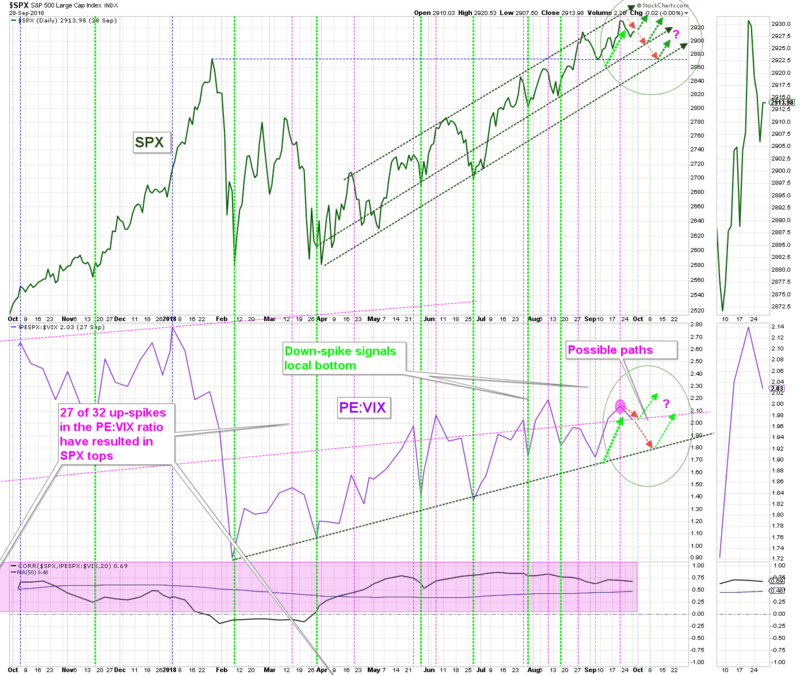 In summary, again this week the fear indicators remain at a level that correlates with bull markets, but there are signs that a near-term correction in the market is likely. 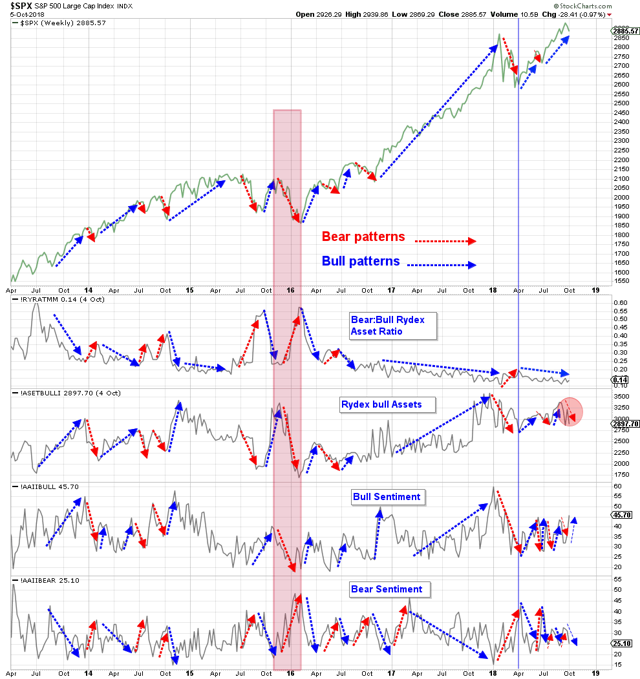 Our overall view is still bullish and any pullback in equities should be short and shallow. The RSI has weakened slightly. The ADX +DI is increasing, and the -DI is decreasing. The stochastic has stabilized . The 10-year minus 2-year Treasury yield differential spiked up this week as the 10-y rose faster than the 2-y. This has the potential of pushing the inversion (sub-zero differential) deeper into 2019 and extending the recession window deeper into 2020-2021 (chart below). In summary, there is reason to expect some level of correction in the near-term, but the bigger picture continues to predict an upward trend. As we argued in the introduction, there may even be a surprising amount of upside yet to come in the longer-term. Again, corrections not withstanding. 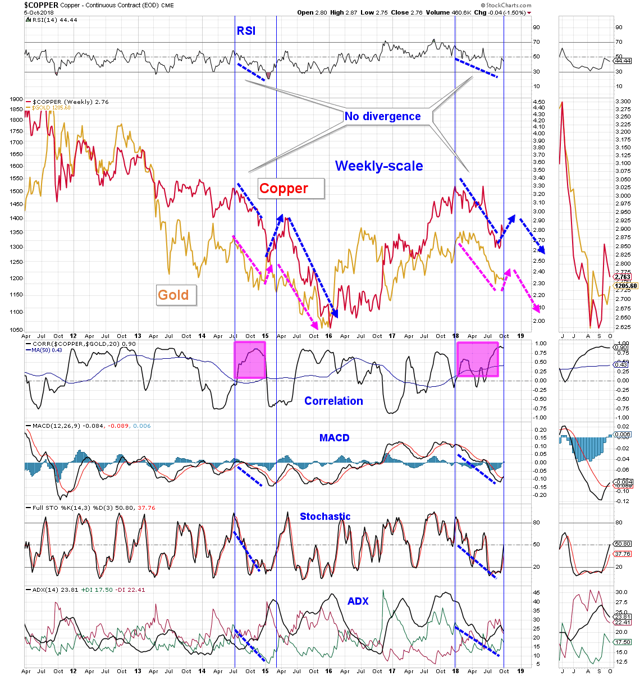 Gold and copper continue to replicate their 2015 pattern. 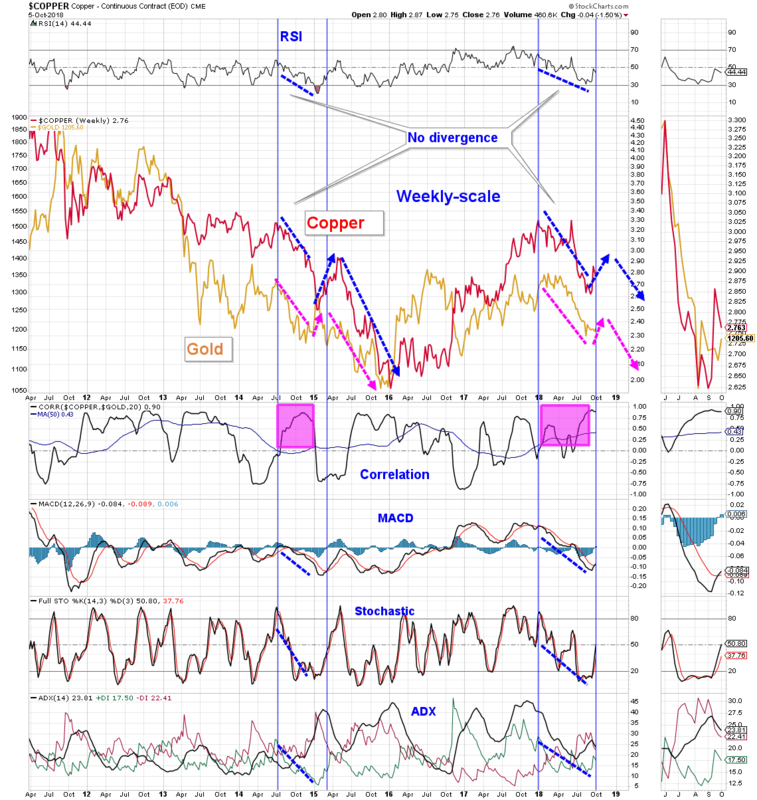 If this continues, after a near-term rally, the price of both metals would drop (chart below). 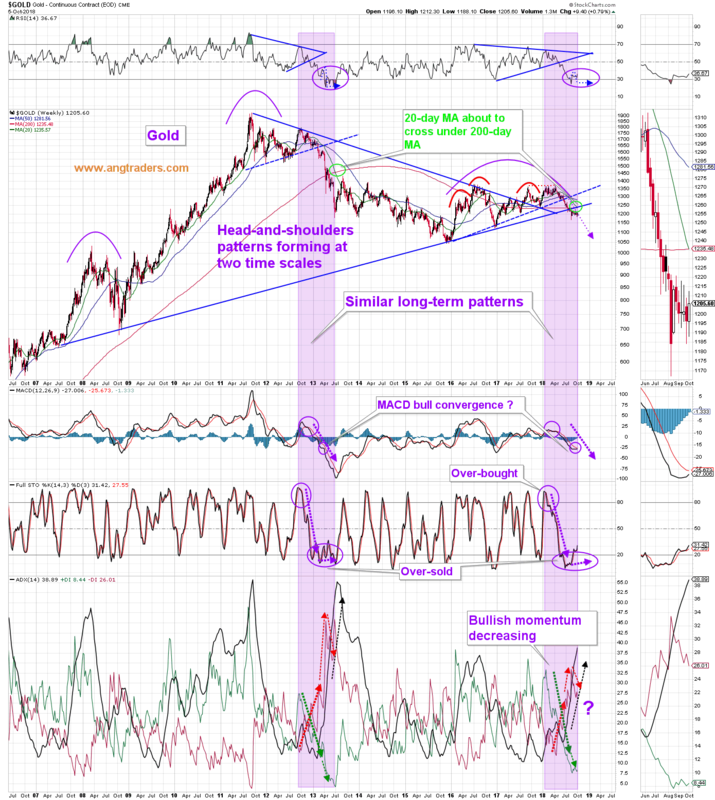 The Yuan/gold pattern from 2017 which we are following is no longer replicating. The Yuan has dropped below support, and while the RSI and ADX are replicating the pattern, the MACD, stochastic, the gold price, and the correlation are not. This weekend the Chinese announced that they have cut the reserve requirement ratio for some banks in a bid to counter a deceleration in the economy. This widens the policy divergence between the Fed and the PBoC as the Fed tightens while the Chinese loosen. 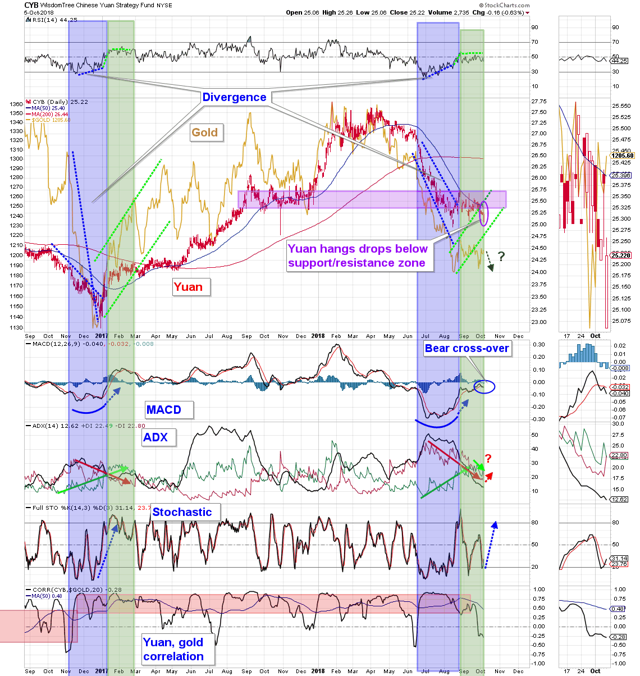 This is likely to cause further weakness in the Yuan which is likely to put pressure on gold (chart below). Gold still has further to fall in order to match the down-move in silver (chart below). The long-term technical situation continues to replicate the 2013-14 pattern where the gold price broke down (purple highlighted rectangles in chart below). The 20-day MA is about to cross under the 200-day MA, like it did in 2013. This may trigger a sharp drop in gold, followed by a bounce, like in 2013. 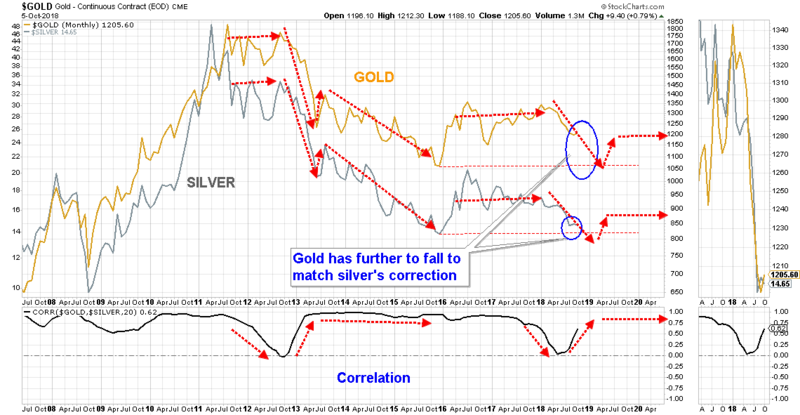 Technically, we could see some downward pressure on gold. 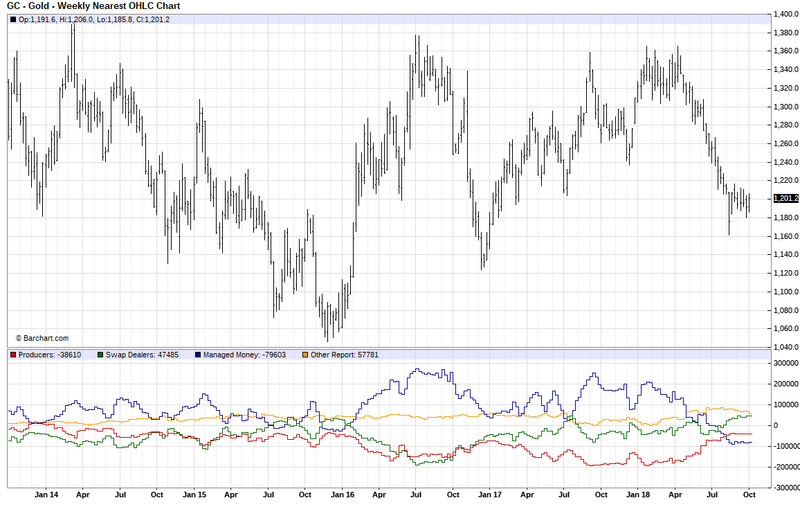 The commitments of gold futures traders remain at historic levels where the large speculators are net short like never before. Although extremes in the net positioning of the large speculators has corresponded to pivot points in the price of gold in the past, the fact remains that these money managers are momentum players who keep their positions as long as they are making money, so until the price of gold starts to lose them money, they will stay in the trade. There is no way of knowing when that will occur. This indicator has not worked over the last several months. We regard it as neutral at this point (chart below). Gold and inflation expectations, as measured by TIP, are once again positively correlated like they were throughout most of 2017, although, recently the correlation has become less positive as gold has held up in the face of a big drop in TIP. 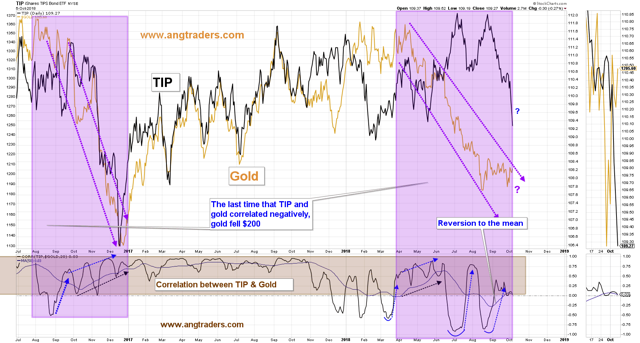 If gold catches up to the move down in TIP, there would be a big drop in the price of gold. 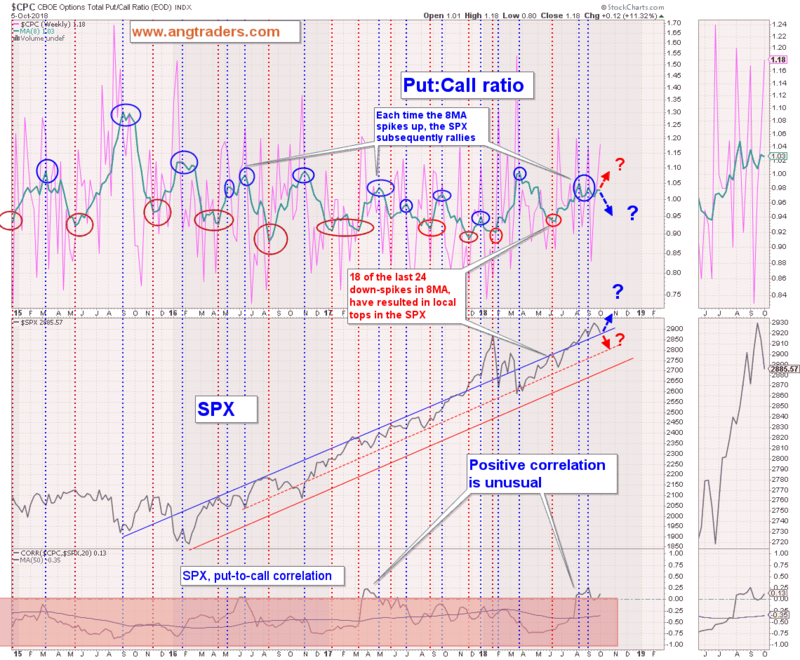 Conversely, TIP could increase causing the correlation to get more positive instead (chart below). We wish our subscribers a profitable week ahead, and our Canadian subscribers a happy Thanksgiving.